Another image taken with the Graflex Graphic 35 camera and Kodak T-Max 400 film. 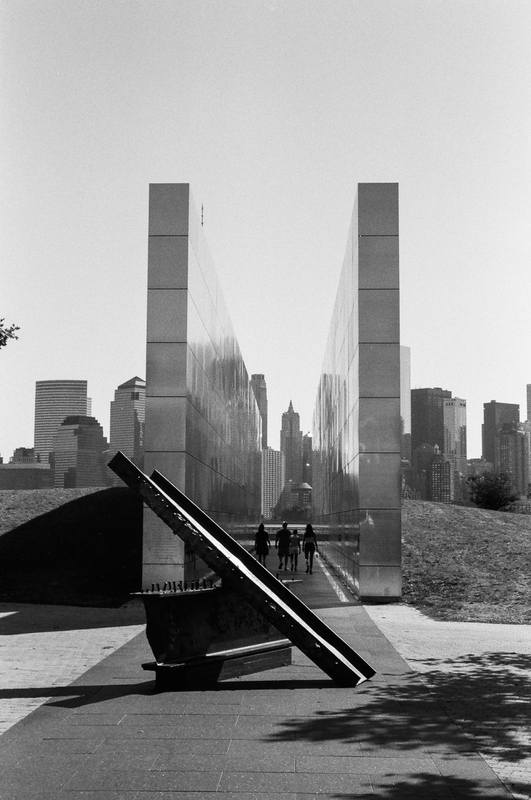 This memorial in Liberty State Park is said to direct your eye to where the Twin Towers formerly stood. I have to wonder, then, why we do not see Liberty Tower now instead. It is partially blocked by the large panel on the right. I took one capture just before this family cam by and walked through. I then realized I was standing a bit close and had most likely cut the memorial off or placed it too close to the edge of the frame. As I was shooting with film I could not check but it turns out I was right. So I started waiting for the family to pass through, but they dawdled and I ended up deciding that they added a nice bit of perspective to the scale of the memorial. Also it was really hot and I wanted to move to the shade. But I think this works. Great shot Mark, love getting a peek at this monument, film is a bonus!